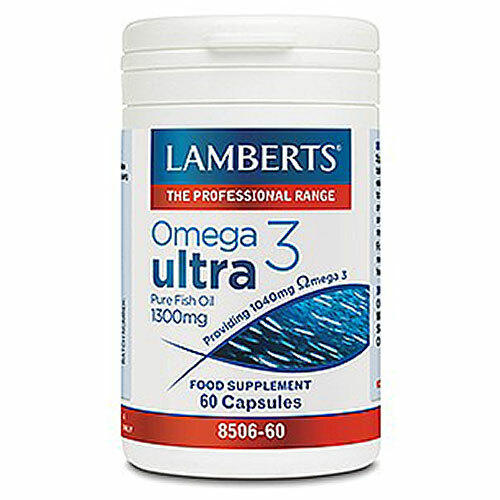 LAMBERTS Omega 3 ultra provides a full 1040mg of omega 3 fatty acids per capsule, including 715mg of EPA and 286mg of DHA. The sophisticated 5-stage purification process that takes place with our fish oil ensures that there is no compromise on quality. Furthermore, to avoid a fishy taste, each capsule shell is impregnated with natural sweet orange oil so that they are pleasant tasting. For those eating 2 portions of oily fish a week, take 1 capsule daily. For those eating little or no oily fish, take 2 to 3 capsules daily with a meal, or as directed by a practitioner or pharmacist. 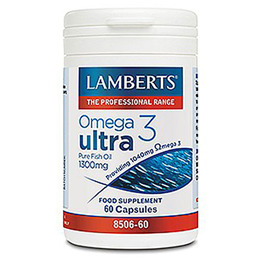 Below are reviews of LAMBERTS Omega 3 Ultra - 60 Capsules by bodykind customers. If you have tried this product we'd love to hear what you think so please leave a review. Omega 3 ultra provides a full 1040mg of omega 3 fatty acids per capsule, including 715mg of EPA and 286mg of DHA.